1. All lifting table trucks have two kinds of lowering systems wire or nut. Specification as requested by you. (S. P. M. - Tailor made as per your specification). 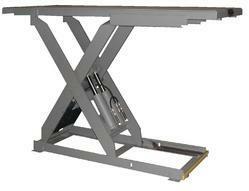 We are offering Hydraulic Scissor Lift Table. 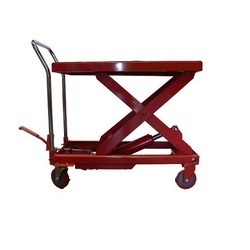 We take pleasure in introducing ourselves as leading firm by offering Hydraulic Lifting Table. The images used in this website are wholly owned by hydro fab, using these images is against copyright. A Hydraulic Simulation Table (sometimes also known as a multi-axis shaker table) is a dynamic system, designed to perform research and development tests. It requires an appropriate configuration, coupled with a Test Controller and features a state-of-the-art digital architecture using the latest hardware and software. To meet the growing demand of the various industries we offer quality-lifting tables such as scissor lift table and die loader. Manufactured using qualitative grades of raw material these are widely used for precision functioning and perfect lifting of material to a suitable height.